An amazing achievement by Brazilian writer Paulo Coelho, two books simultaneously at No2 in the New York Times best-seller lists. US is biggest English speaking market and Paulo Coelho has two books at Number Two. Adultery was published in the English language, 14 August 2014 in UK and 19 August 2014 in US. 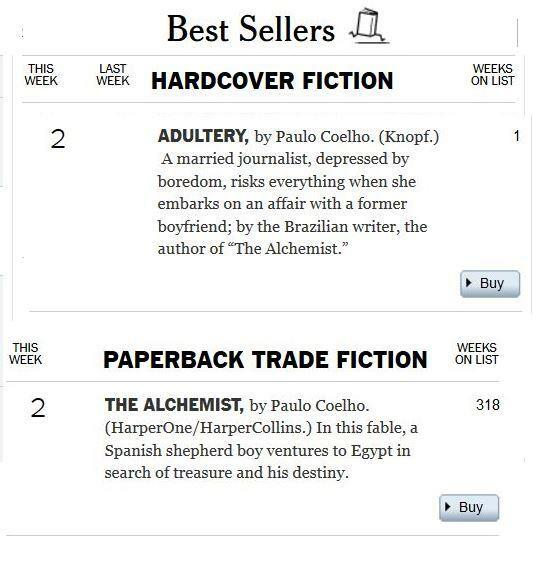 Adultery is today Number Two in the New York Times best seller list for hardbacks. Adulterio en español el número uno. The Alchemist was was first published in 1986. Twenty six years later, it is today Number Two in the New York Times best seller list for paperbacks. It has now recorded three-hundred and eighteen continuous weeks in the New York Times best seller list. According to deputy manager of WHSmith Guildford, it is opinion Adultery a best seller. According to deputy manager of WHSmith Guildford, it is opinion Paulo Coelho best selling author. When you get insulted, remember an Arab saying: "the dogs bark when they see a caravan moving ahead"
SLOVAKIA: " I am happy to tell you that Adultery went direct on nr.1 in SVK Martinus book chart!!!" This entry was posted on August 31, 2014 at 8:59 pm and is filed under books, Paulo Coelho. You can follow any responses to this entry through the RSS 2.0 feed. You can leave a response, or trackback from your own site.